ATTD has become synonymous with high-calibre scientific programs that have provided participants with the latest in diabetes research and analysis, complemented by new and exciting developments in diabetes-related technology.
" The conference was excellent – really well done and we are looking forward to another successful meeting in 2016.	" 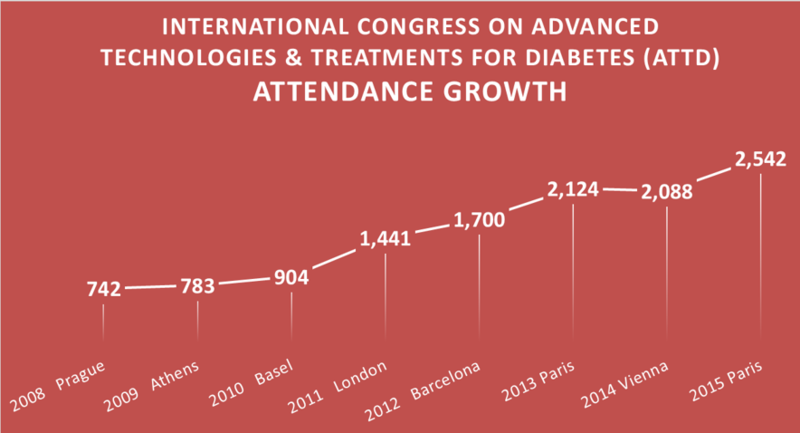 Geneva, Switzerland, February 23, 2015 – Kenes Group, a leading Professional Conference Organiser (PCO) and Association Management Company (AMC), today reported a record breaking 2,542 participants at ATTD 2015 (http://attd.kenes.com) – the International Conference on Advanced Technologies & Treatments for Diabetes recently held in Paris, Feb. 18-21. The conference welcomed an international audience of researchers and clinicians from the fields of diabetes, endocrinology and metabolism, diabetes technology developers as well as general and family medicine practitioners from over 90 countries. Now in its 8th successful year, ATTD 2015 was deemed the most successful conference to date and received heartfelt thanks from ATTD Co-Chairperson, Prof. Tadej Battelino. “To my colleagues at Kenes, I cannot thank you enough for everything,” he wrote following the event. Prof. Battelino serves as the Chief Executive of the Department of Pediatric Endocrinology/Diabetology and Metabolism at the University Children’s Hospital in Ljubljana, Slovenia and is a member of Scientific Advisory Board of D Medical Industries. “The conference was excellent – really well done and we are looking forward to another successful meeting in 2016,” he added. ATTD has become synonymous with high-calibre scientific programs that have provided participants with the latest in diabetes research and analysis, complemented by new and exciting developments in diabetes-related technology. ATTD brings the world’s leading researchers and clinicians together for a lively exchange of ideas and information related to the technology, treatment and prevention of diabetes and related illnesses. A truly unique delegate experience, ATTD was first launched in conjunction with Kenes, who created the original concept and branding of this global important global meeting. ATTD 2016 will be held in Milan, Italy, February 3-6, 2016. Visit the website for more info.